E & T Underwood manufactured cameras at their Brunswick Works, 130-2 Granville Street, Birmingham from the late 1880s. In 1905 they advertised a leather-covered ¼-plate folding camera named the “Foldette” which was also available as a Triple Extension Foldette. 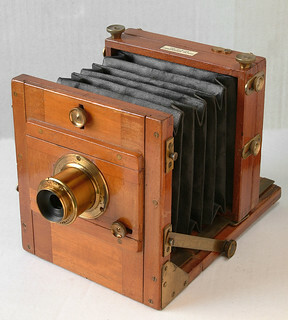 ↑ Full-plate Club field camera (it was also made in half-plate size) at Early Photography. ↑ Quarter-plate Instanto tailboard camera (the Instanto was made in sizes up to full plate) at Early Photography. British Patent 6017 of 1895, An Improvement in Sheaths for Photographic Plates, lodged 22 March 1895 and granted 18 January 1896 to Edwin Underwood, describing a design for metal plate-sheaths (not dark-slides; holders to be used inside a camera), with a small side-tab allowing the sheaths to be manipulated through the fabric of a changing-bag attached to the camera. British Patent 6018 of 1895, Certain Improvements in Change Boxes of Photographic Cameras, also lodged 22 March 1895 and granted 18 January 1896 to Edwin Underwood, describing the design of a plate changing box (a falling-plate magazine) for the rear of a camera, the plates held in metal sheaths running forward to the exposing position, pushed forward by a spring, and falling to the floor of the camera once exposed. The box has a counter showing how many plates have been exposed. British Patent 7309 of 1896, Certain Improvements in Photographic Shutters, lodged 4 April 1896 and granted 6 February 1897 to Edwin Underwood, describing a design for a roller shutter giving time and single-speed instantaneous exposures. This page was last edited on 14 February 2016, at 09:30.